Conveniently located off State Route 8 Exit 5 (Broad Blvd. ), St. Joseph Parish School is found in the third block on Broad St. in Cuyahoga Falls, just five minutes north of Akron. A Catholic elementary school for grades preschool through eighth, the school allows children to not only learn and grow in academics but in faith and as children of Christ. St. Joseph’s offers several community service projects throughout the year to teach empathy and compassion for others. It's mission is to proclaim the Gospel message of Jesus Christ, and help students apply that message in their daily lives while growing in faith, knowledge, and stewardship. Named a National Blue Ribbon School of Excellence, Saint Joseph's offers classes in traditional subjects as well as art, music, band, physical education, Spanish, and technology. 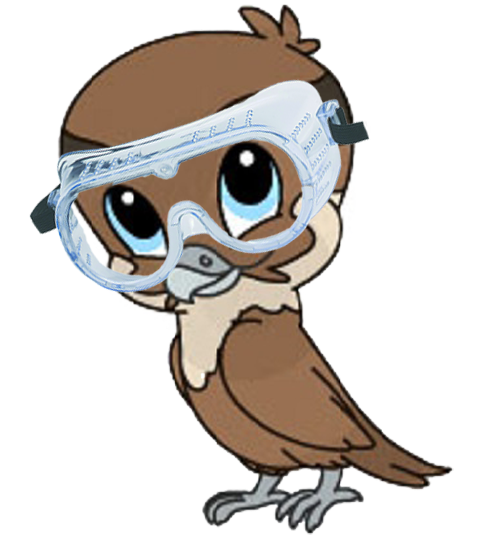 The curriculum includes X-STREAM learning integrating content subject areas, allowing the opportunity for Problem/Project Based Learning, and hands-on discovery across all grade levels. Through its CYO program, St. Joseph students are able to participate in a complete sports program. St. Joseph Parish School is pleased to announce a spring Incentive for registering your children for our wonderful 2019 - 2020 Early Childhood Learning Center! Register for both preschool 3’s (3 ½ days) and preschool 4’s (4 ½ days) - - a two-year commitment - - and receive 2.5% discount off the 3’s tuition and 5% off the 4’s tuition the following year. Register for both Pre-kindergarten (5 full days) and Kindergarten - - a two-year commitment - - and receive a 5% preK discount PLUS a 10% discount off your kindergarten tuition the following year (2020-21). 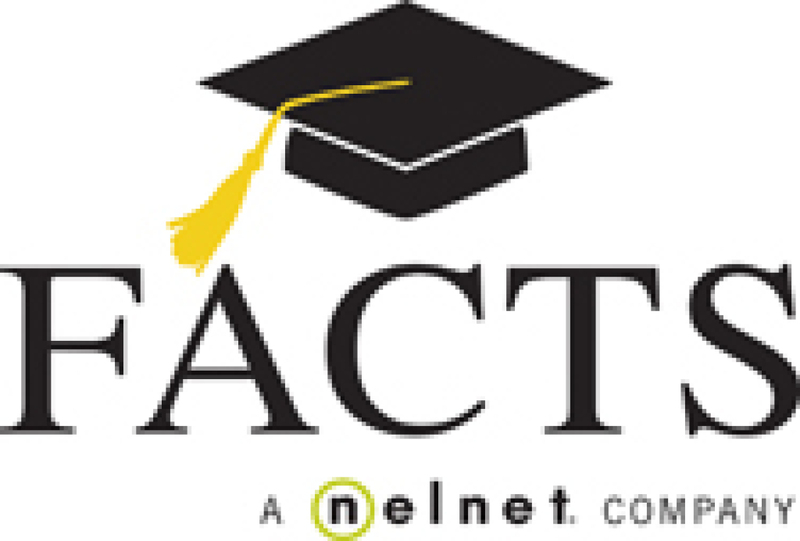 Registration fees for either incentive must be paid at time of registration to qualify. These offers are only valid through April 30, 2019. For more information, contact the School at (330) 928-2151! 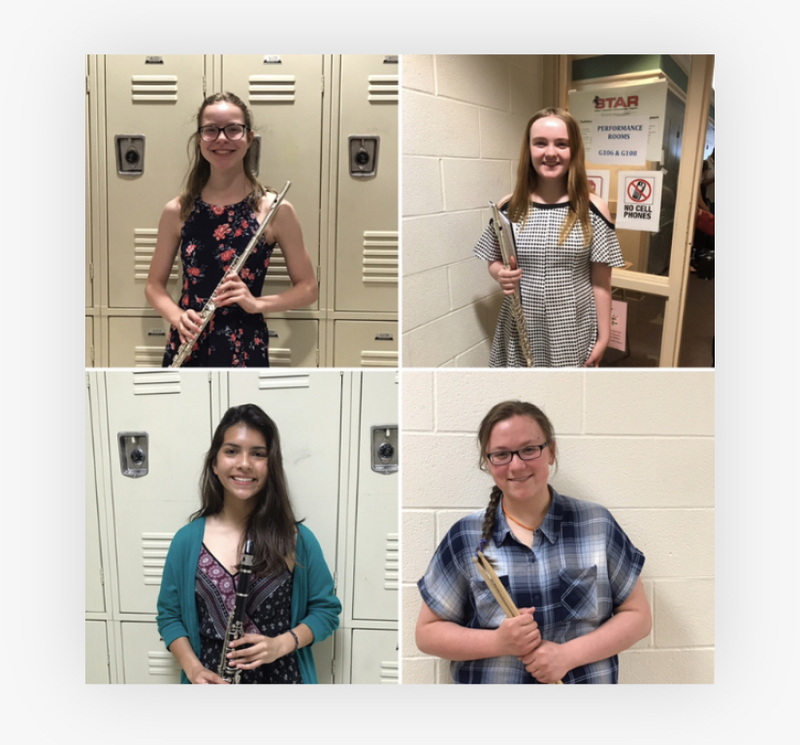 Congratulations to Tori, Gabi, Sara, and Erika who each performed a solo at the Ohio Music Education Association Adjudicated Event on Saturday, April 13. Each received the highest rating of Superior. We are proud of these talented and dedicated band students! 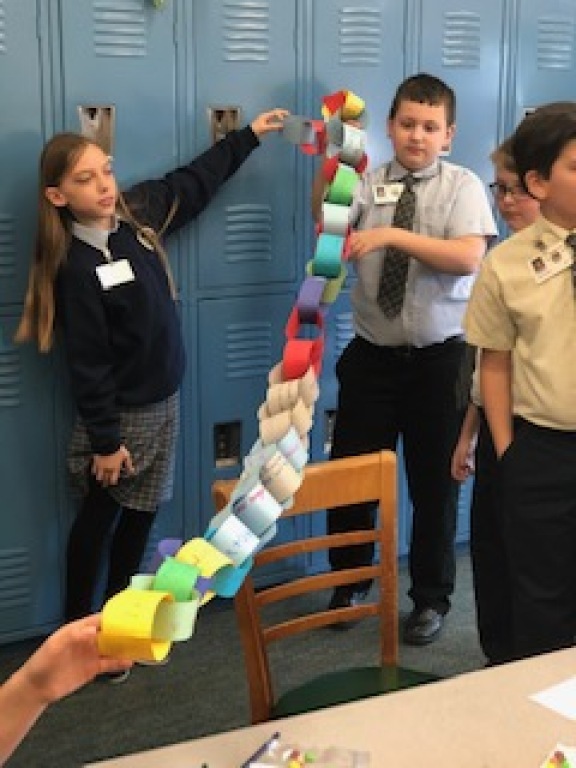 In conjunction with our partnership with the University of Akron Polymer Institute, St. Joseph Parish School Families joined School staff and members of the University to investigate and experiment with different types of polymers. To view additional photos, click here! Mrs. Nowak, a dental hygienist from Dr. Mark Grucella, DDS and Dr. James George, DDS Family Dentistry, stopped in to visit our 2nd grade to teach the students more about dental hygiene. The students enjoyed a brief video highlighting the importance of brushing twice a day and flossing at least once a day to be a Dental Defender from the Plaque Attack! Remember, Stribe for 'Sparkle Time!' After the video, the participated in an activity to make choices of which food are good and bad decisions for teeth and practice brushing on the dental Dino. On Tuesday, March 19 St. Joseph Parish School students celebrated St. Joseph Day in honor of its patron saint. Students attended a special mass to celebrate the solemnity with Bishop Perez. Later in the day, the St. Joseph students participated in the St. Joseph Table. Just as St. Joseph proclaimed his faith through actions instead of words; students created a traditional St. Joseph Table to do the same. The table contains a statue of St. Joseph, flowers, candles, breads, and sweets. There are many legends about people who prayed to St. Joseph in time of famine, and miraculously they were provided food. With their St. Joseph Table, students provided food to the Labre program, St. Bernard’s hunger center, and a check for $162.95 to the Peter Maurin Center. 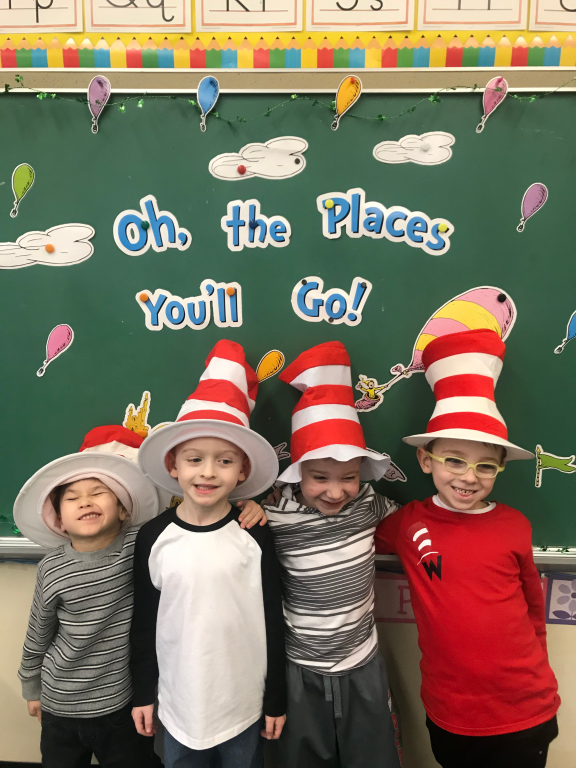 Our students in grades PreSchool, Kindergarten, First Grade, & Second Grade celebrated the entire week in honor of Dr. Seuss. The students spent the week reading a different Dr. Seuss book along with fun Seuss themed activities! Ms. Herideen's PreSchool class even enjoyed some Green Eggs & Ham! Temporary movement and sensory flooring! 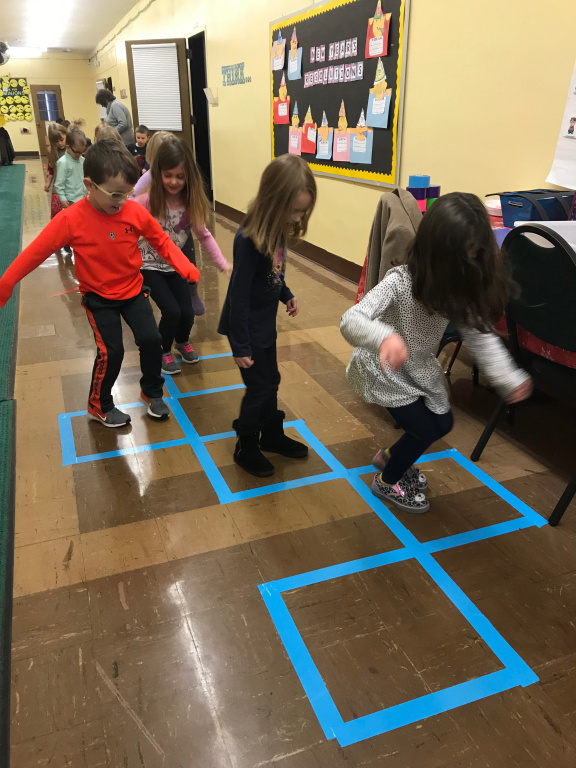 As a method to further the development of our children, we have installed temporary movement and sensory pathways designed to help students release pent-up energy and let them relax and refocus on learning. We are looking into installing a more permanent flooring in the near future. In February, our Students celebrated 100 Days of School! Mrs. Haubert's Kindergarten Class had a list of activities from counting to 100 to building a 100 plastic cup wall. Mrs. Kaminski's 2nd-grade class also had a number of 100-day activities and even dressed up for the day! Congratulations the the Schmitt Family for winning the 2019 Tuition Raffle! In February, the Children’s Concert Society visited to present the concert “Found Sounds.” This performance took all grades on an exciting musical journey to the islands of Trinidad and Tobago, the birthplace of the steelpan. Students also listened to, as well as participate in tamboo-bamboo, traditional Caribbean tunes, classical music, and modern socas. Grades K to 2nd Grade participated in a surprise CSW Challenge, a Dribbling Obstacle Course. Grades 4&5 cheered them on with the assistance of some cheerleaders! Congratulations to Drew Gaffney, who took 1st place, followed by Robby Murphy and Kyle Cassidy! The children had a blast dribbling through the obstacle course! Another exciting day at Saint Joseph Parish School! The BIG CATHOLIC SCHOOLS WEEK CHALLENGE was postponed due to cold weather but did not stop us from having fun! There were four sets of basketball games for Student vs. Teachers! 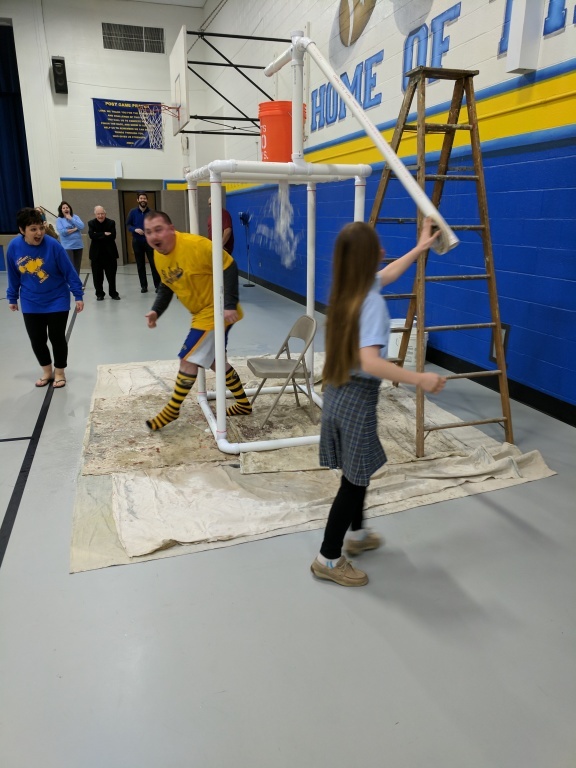 While we all had a fun time with the Big Catholic Schools Week Challenge, the students did make the game a challenge for the teachers. Referee Orndorff (aka Fr. Jared) ensured that a fair and fun game of “F-A-L-C-O-N-S” was played by all groups. 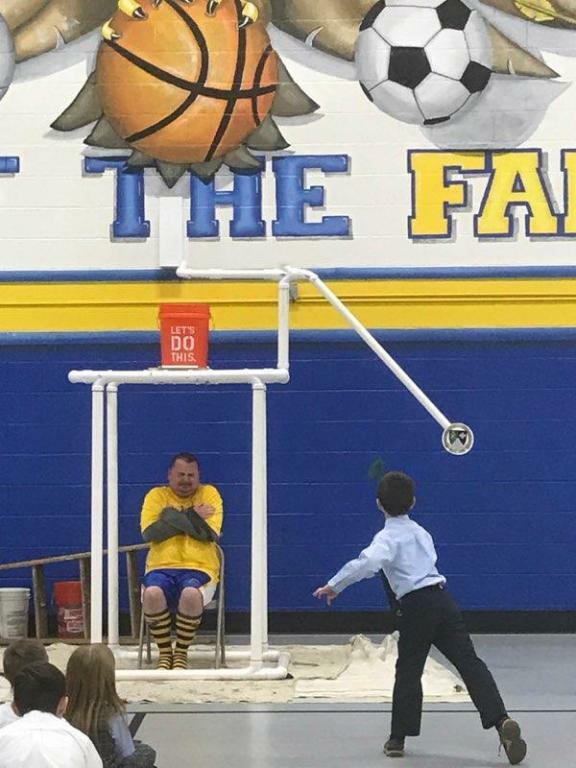 All students and Faculty/Staff played well, but we’d be remiss in not sending a Shout-Out to 6th grader Logan Leenheer for hitting the only three-point shot in any of the games! As a model for our children, we invited families to attend a morning activity of Prayers and Pastries with Parents. We gathered bright and early in the morning before school for a prayer service in the School Theater followed by pastries in the School Cafeteria. Thank you to all the parents and families that came out for this delightful morning! 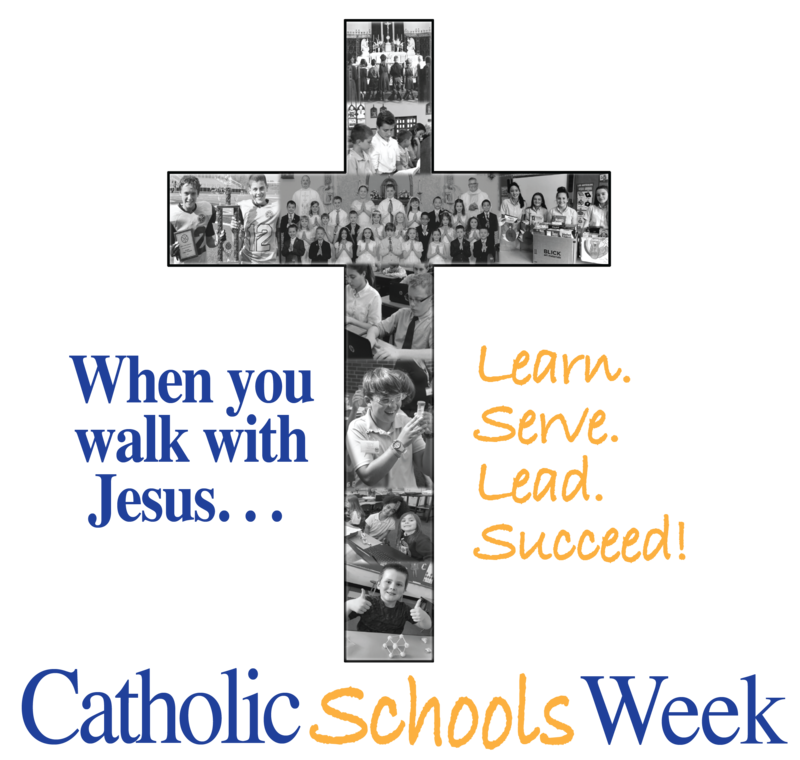 Part of Catholic Schools Week, the students participated in an all-school retreat that focused on the theme, We are anchored in Christ as we walk with Him. The day started off with a video and discussion about the Mass with Fr. Jared, a rotation of activities, and concluded with a prayer service! 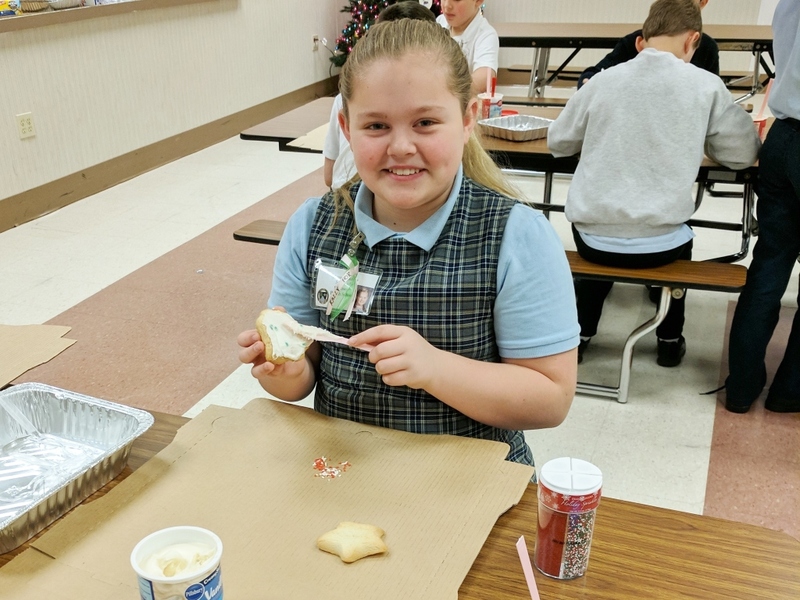 Students at St.Joseph’s School “walked with Jesus” as they made bologna and cheese sandwiches to go out to those on the streets of Akron who are experiencing homelessness. Ed Plaspoh, from Walsh Jesuit’s Labre program, spoke to our students and staff bringing awareness and education concerning homelessness. The Students made over 200 sandwiches that will help provide a meal to over 100 of our friends living in the extreme weather this winter without shelter and food. The WJ Labre program has been ministering to those in need each Monday for 11 years and graciously appreciate the meals that our students help to provide. Please keep those who we stand in solidarity and communion within your prayers this week as temperatures become extreme. St. Joseph Parish School’s ECLC and First Grade participated in a children’s ballet presented by the Ballet in the City. The presenters bring a passion for and knowledge in ballet as well as young children with a presentation structured around literacy, movement, and response to music. The presentation featured the story Max by Rachel Isadora along with the music, movement interaction with the children, and a live performance by talented young ballet dancers. St. Joseph Parish School's Book Fair will be held January 23-28. They will be operating from 8:00 a.m. until 3:00 p.m. each day. Classes will come during a scheduled time. The Book Fair will also be open during the Catholic Schools Week Open House on Sunday, January 27 from 9 am-12 pm. Click here for more information. 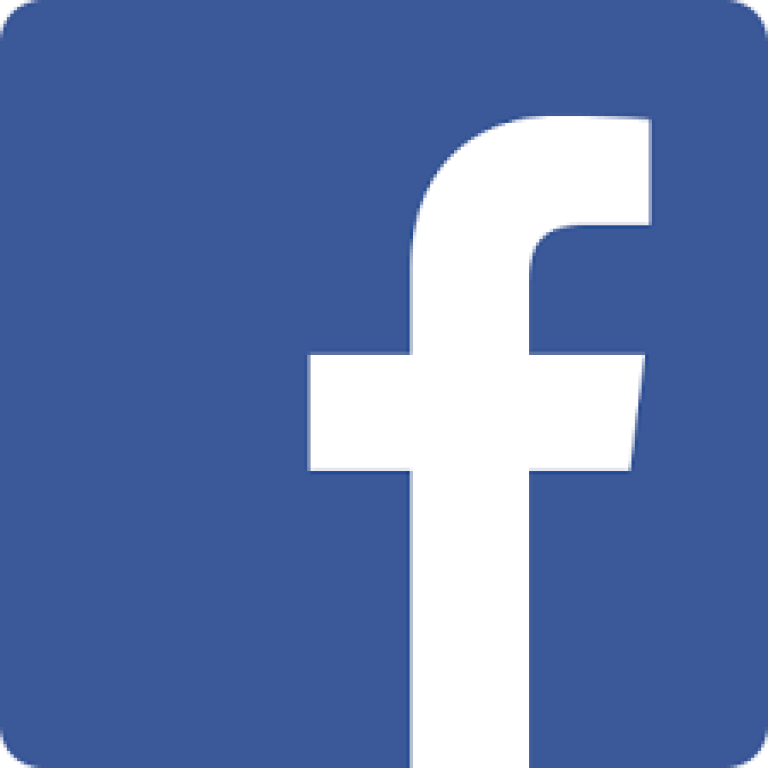 They will also be having an online Book Fair from January 18th thru February 8th. You can access the online Book Fair by logging onto http://www.scholastic.com/bf/stjosephschool12. This is a perfect way to “go to the Fair” in the convenience of your own home if you can’t make it into school. There are no shipping or handling charges. You simply pay a little bit in tax and your purchases will be delivered to the school and we will deliver them to your child. 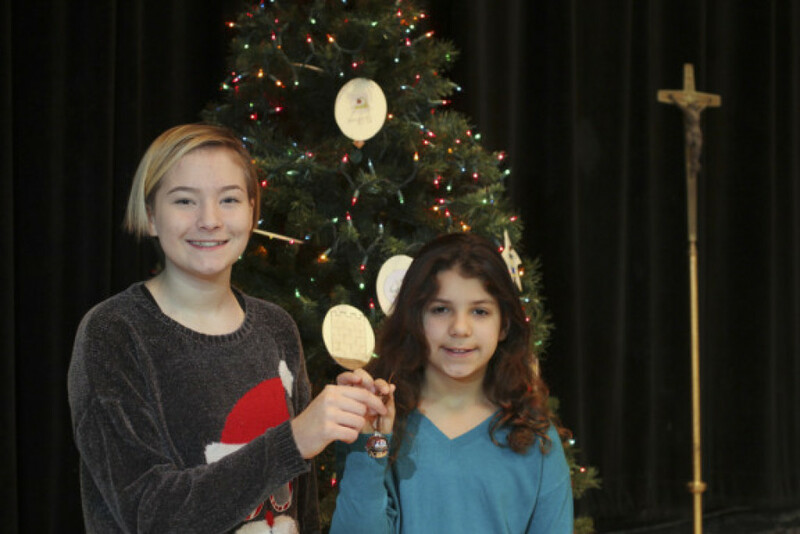 On Wednesday, December 19, Saint Joseph Parish School held the annual Christmas Concert. This performance highlighted our Preschool/PreK, Kindergarten, and all even grades. 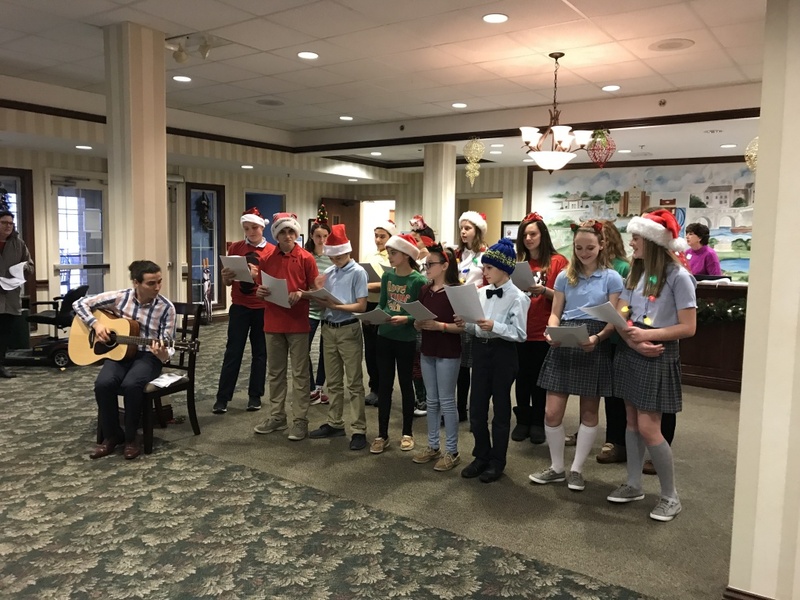 The Saint Joseph Parish School STU Crew (aka Student Council) made time to bring some holiday cheer and goodwill to the residents of Danbury Woods Assisted Living and Retirement Home in Cuyahoga Falls. The students put on a Christmas pageant complete with Christmas carols, dance numbers, and stand up comedy. Afterward, the students socialized with the residents, praying with them and wishing them a Merry Christmas. Saint Joseph Parish School educates students in grades preschool through eighth. St. Joseph choir & band members participated in Cuyahoga Falls Tree Lighting Ceremony on Saturday, November 24 to announce the start of the Holiday Season. Mrs. Lorrie Wenmoth organized the school band and coordinated School & Parish Choirs to join in on the festivities. 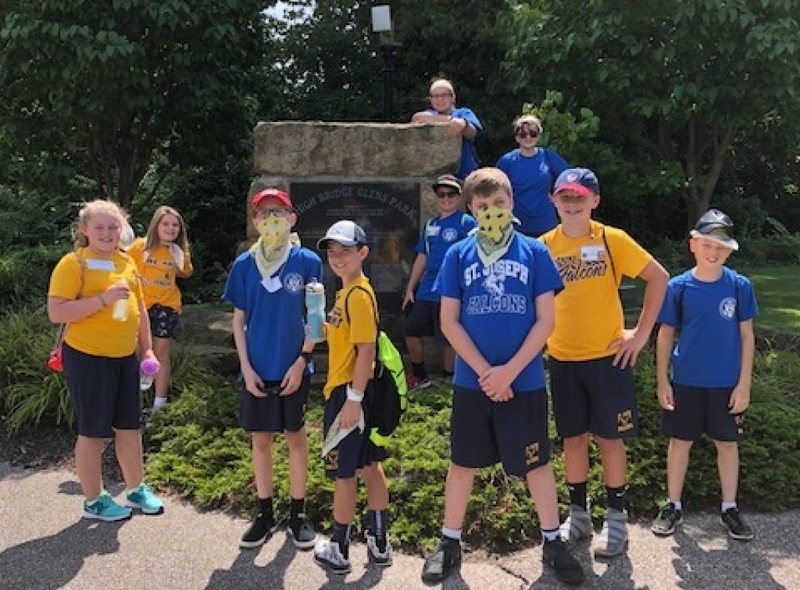 Our wonderful Eighth Graders had the opportunity to travel to Washington D.C. for one final educational expedition as they finish up their final year at St. Joseph Parish School. They were able to see a multitude of landmarks in our nation’s capital. A good time was had by all! Congratulations to our St. Joseph School Graduates! May 25th was celebrated with a morning awards ceremony and evening graduation and family social. Prayers and well wishes to them as they begin their high school journey. X-STREAM lab keeps our 8th graders engaged in learning even during their last week at St. Joseph Parish School. 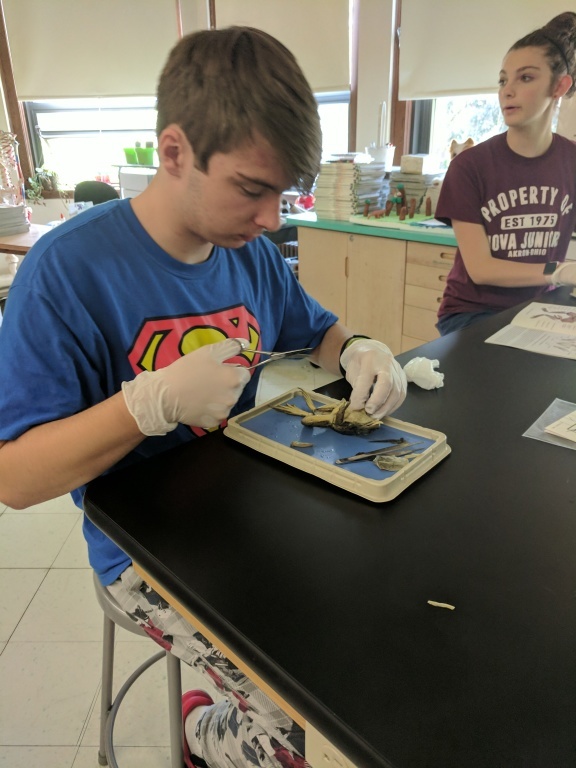 This week's project: frog dissection. Congratulations to our St. Joseph Parish School Christian Leader Award Recipients. We are pleased this year to again honor those students who have exceptionally demonstrated living as a faith filled disciple of Christ here at St. Joseph Parish School. 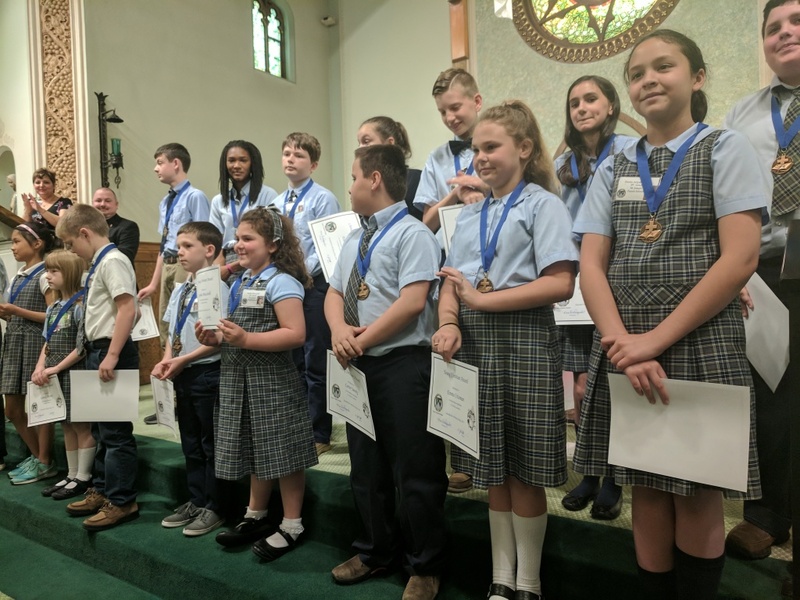 A boy and a girl from each classroom in grades 1 - 8, selected by her/his peers and teacher, were recognized for their charity in dealing with fellow classmates. It honors those students whose actions are centered in our Gospel values by practicing kindness and consideration towards others at all times. St. Joseph Parish School Fourth Graders raised $775 for St. Jude Children’s Hospital through their annual Math-a-Thon. To raise money, s tudents ask friends and family to sponsor their completion of an entire math workbook, usually during the six weeks of Lent. 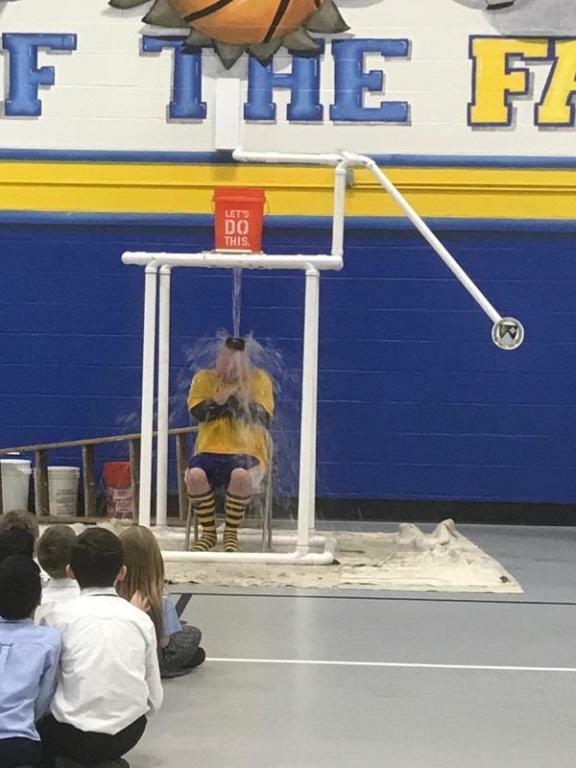 This is the 17th year St. Joseph Parish School has held the Math-a-Thon. To date, students have raised more than $28,000. Students pictured in the front row are Carter Jansky, Gabriela Pluto, Lexie Jansky, Tommy Gaffney. In the back row are Chase Voorhees, Ryan Tackett, Abigail Zackasee, Emma Bryant. 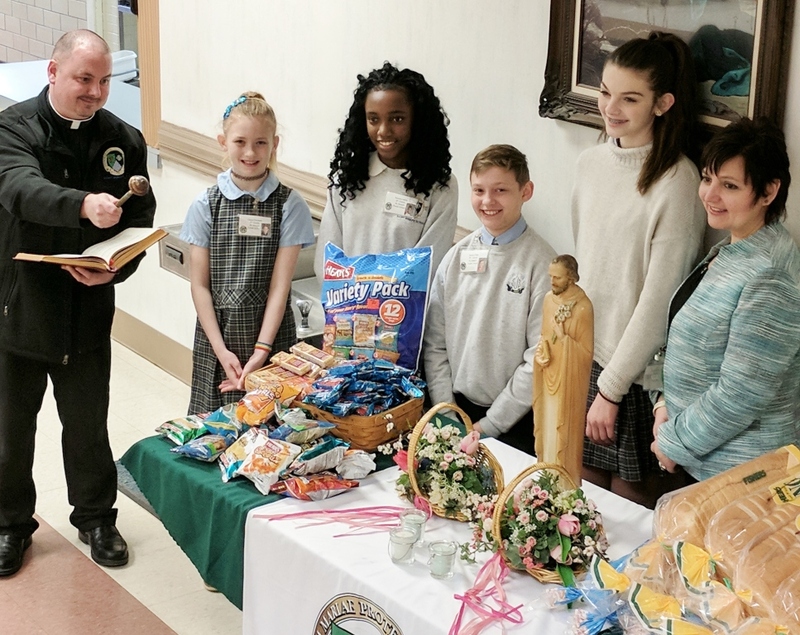 St. Joseph Parish School students gathered items to create more than 60 baskets to be distributed through Summit County Children Services for Easter. St. Joseph works with Summit County Children Services every year on this worthwhile project. Pictured with the baskets they constructed are (front row l to r ) Nick Herbele, Kya Epps, Ryan Sharp, Haleigh Schulda, Paiton Hagen, (back row l to r) Joe Bee, Annika Nichols, Nick Melchioris, Joe Conti, and Zack Reed. On Monday, March 19 St. Joseph Parish School students celebrated St. Joseph Day in honor of its patron saint. Students attended a special mass in St. Joseph's honor. Just as St. Joseph proclaimed his faith through actions instead of words; students created a traditional St. Joseph Table to do the same. The table contains a statue of St. Joseph, flowers, candles, breads and sweets.There are many legends about people who prayed to St. Joseph in time of famine, and miraculously they were provided food. 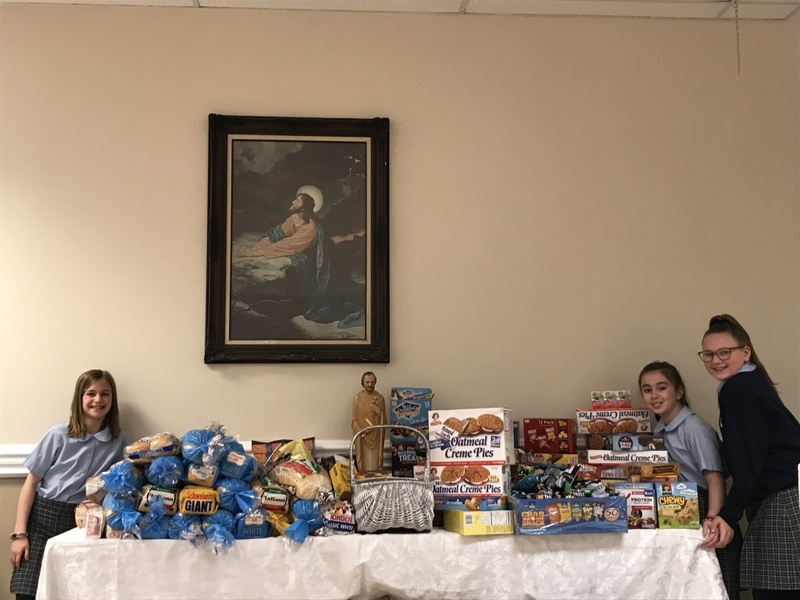 With their St. Joseph Table, students raised $150.75 for St. Bernard's Hunger Center, and donated 50 loaves of bread to the Walsh Jesuit Labre program and 135 individual snack/cracker packs to Blessed Trinity Food Pantry. 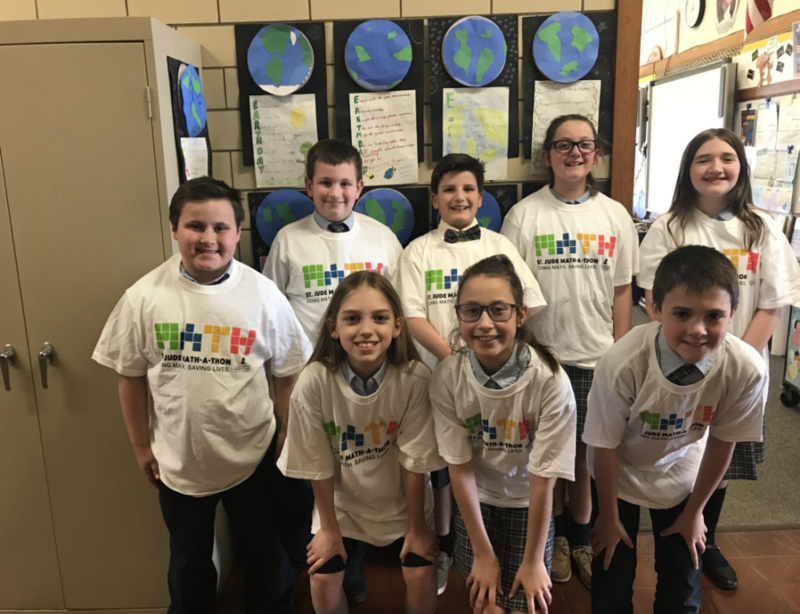 Throughout Catholic Schools Week, Saint Joseph students participated in many activities to raise awareness and money for the Leukemia and Lymphoma Society (LLS). They listened to a LLS rep at an assembly, had a dress down day, put on a Penny War, and raffled off chances to soak the pastor (Fr. Jared Orndorff), the principal (Mrs. Carrie DePasquale), and the X-STREAM science teacher (Miss Megan Fearon). The students brought in so many pennies, we are still counting to come up with the total money raised! As of 2/5/18, the students surpassed their $750 goal with $1,000 in donations alone.